This meal is quick and potentially versatile, which is just how I like my dinners these days. Vegetable fritters are great fridge cleaners–use whatever you may have on hand, as I did, or stick with just one type of vegetable if you prefer. This particular recipe makes use of besan (garbanzo bean) flour, making them very much like an Indian pakora. 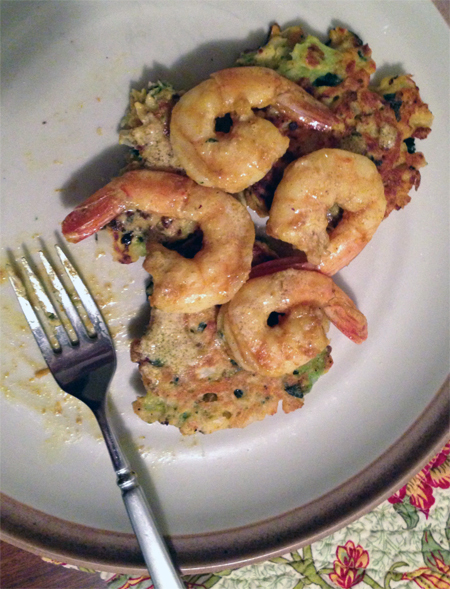 As with most vegetable fritters, they seem to have an affinity with yogurt-based sauces, so I decided to top ours with some quick curried shrimp. We found these so delicious that Jeremy had inhaled his first plateful by the time I sat down to the table with my plate, and I very nearly did the same before stopping to think that maybe I should photograph it first. Fritters like these are an excellent substitute for a starchy side dish like biscuits; they are filling and pack a big vegetable punch. They also reheat well, and are delicious with basted eggs for breakfast, as I can attest. Steam the cauliflower and broccoli in chunks until tender. Remove from steamer, drain, and chop into 1/4 inch pieces. Meanwhile, sauté the onion, garlic and ginger in butter or coconut oil, until the onion becomes soft. Add the sweet potato and kale, and cook until all vegetables are tender. Add the cauliflower and broccoli, and set aside to cool slightly. In a large bowl, mix together the besan flour, eggs, salt and ginger powder. Stir in the cooked vegetables. If you have too many vegetables for this amount of batter, you can add another 1/4 C besan flour and one more egg; or you can just save the extra veggies for another meal. Heat a skillet with coconut oil, ghee, or bacon grease over medium heat, and cook the fritters like pancakes in roughly quarter-cup portions. Serve them with cumin-scented plain yogurt or kefir, or try them with the easy curried shrimp below. This recipe makes about 9 fritters of this size, and leftovers are delicious with your eggs for breakfast. Toss the shrimp with the salt, curry powder, and olive oil, and allow to marinate for up to 30 minutes. (I thawed my shrimp while chopping vegetables, and marinated while cooking vegetables. The shrimp and fritters cooked simultaneously.) Heat a skillet over medium high heat with the coconut oil and add the shrimp; cook for 2-3 minutes per side, until pink and cooked through. Take the skillet off the heat, add the yogurt or kefir and ground spices, and serve immediately over the fritters, making sure to drizzle all of the spiced yogurt over top. Update 2/7/14: I ended up cooking about a cup more vegetables than I cared to make into fritters, so I saved them and used them for lunch the next day in a sort of primavera topping for baked potatoes. I reduced some heavy cream with the veggies in a skillet, added splashes of lemon juice and Worcestershire sauce and a sprinkle of garlic powder for flavoring, and then melted in two slices of Provolone cheese. This was delicious, felt fancy somehow, and made enough topping for two baked potatoes. 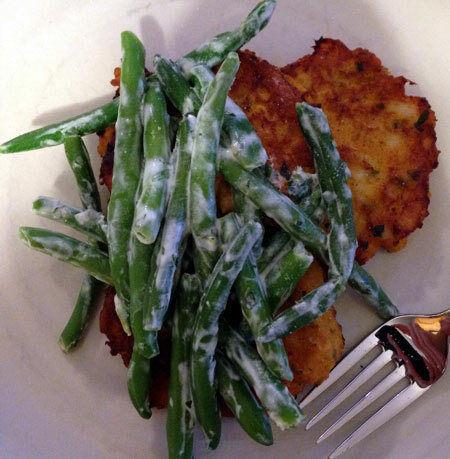 Update 4/24/14: An even easier adaptation of the fritters served with cod for dinner. I steamed about 1.5 C broccoli and half a chopped onion until tender, then dumped in the food processor with 2 eggs, 1/4 C besan flour, and around 3/4 C cooked leftover sweet potato. Pureed this mixture until blended and coarsely chopped, and fried it up in lard. Delicious with the orange-miso cream sauce from the fish. Update 5/11/14: Another easy variant–codcakes made with half of a large roasted sweet potato, 1 egg plus 1 white, 1 fillet of poached cod, several tablespoons of chopped fresh herbs (mostly oregano and tarragon), and about 1/4 C garbanzo bean flour. I fried up the fritters in a mixture of lard and bacon grease, and served with green beans tossed in a simple sour cream sauce (sour cream, preserved lemon juice, salt, and chopped fresh herbs). Jeremy loved the fishcakes this way and complimented them several times; Theo liked them also.